I wanted to post a picture of our little Gappie in celebration of having her in our lives for one full year! We adopted her from a rescue shelter in January 2008 and it has been a very exciting year with her! We've been through separation anxiety, skin allergy issues and the destruction of virtually EVERY toy at the pet store! We think we've finally gotten it all right. She is happy and healthy. She LOVES her toys - especially her Nylabone and her Orbee-tuff mint ball! When it's time to settle down she loves to cuddle up on the couch into a little ball. She is excited for summer to arrive so she can resume her 'warm-weather' activities such as swimming and biking and rollerblading alongside us. She is getting better with her commands and knows how to stay, sit, lay down and roll over! 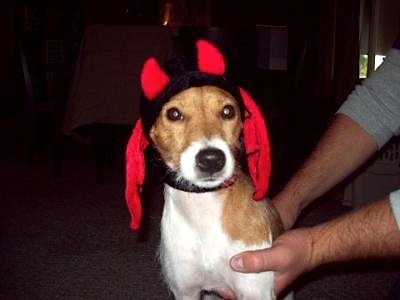 Here she is in her Halloween costume - a little devil hat! She is quite the devilish dog, but we love her to pieces and wouldn't trade her for the world! !